In my 25 years of doing family trees, I’ve found no greater joy than coming across a story or a photo of an ancestor, either my own or in someone else’s tree. Photographs make our loved ones seem more real, while stories written by or about them share a small piece of their life journey with us. Above all, photos are a reflection of our ancestor’s character, revealing how they lived and what type of legacy they left behind. When you come across a mysterious photo in your family archive, or are given a box of old photos from a relative, you may feel stumped! Who were these people? What can I learn about them? Here are a professional genealogist’s tips for uncovering family history in old photos. It goes without saying that a photo that is identified with a name, year and location is invaluable, but even those with no description can add depth to your family story. Of course, photos may also confirm or dispute that same story, often clarifying your family history research. But what do you do if you find a photo and there are no details to go along with it? Anyone who has worked on a family tree has probably discovered that it was quite common for children to be named after their parents and/or grandparents – boys more than girls it seems. The result is you end up with two or three generations of men named Charles Bolton, for example. Then one day while using software such as Ancestry, FamilySearch or the MyHeritage, you hit the jackpot! You locate a profile for Charles Bolton born in 1901 and attached to it is a photo labeled “Charles Bolton, Arthur, Illinois.” The picture quality is poor so it’s difficult to tell his age, but right away you notice something seems a little off. In this picture Charles is wearing a slim cravat with a very small bowtie, a long, loose jacket, loose-fitting trousers. A wide-brimmed hat appears next to him. (See Photo on the Left) You realize this picture is connected to the wrong Charles Bolton because the clothing style is more fitting of the 1870s rather than the early 1900s, but you’ve still opened up a treasure trove of details. Now, you can use the photo as a stepping stone to more concrete conclusions about your ancestor. So now that you know you’ve found a picture of Charles Bolton, Sr., you ask yourself when it was take and what you can learn about his life from looking at one image? Turning to census information is often the next best step. In the 1880 census, you find that Charles Bolton, Sr. was living in Arthur, Illinois, and his occupation was “a dry goods merchant.” The quality and completeness of his outfit suggests he was doing pretty well for himself. You can tell this portrait was taken in a nice studio, complete with vintage table and chairs as props, and an elaborate painting on the wall behind him. Clearly your ancestor invested in this portrait of himself. Noticing the smallest details can help you solve a picture riddle. Look for tiny clues with a magnifying glass (any kind will do) or a photographer’s loupe. You can purchase magnifying glasses at office supply stores, drugstores and many chain stores. Remember, it’s the details that help us zero in on identifying and dating old family photos as accurately as possible. 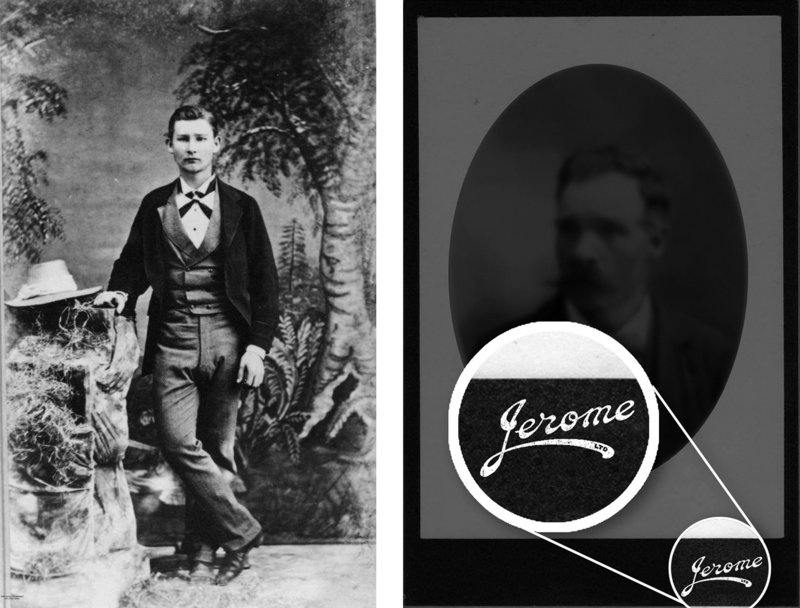 When taking a closer look at the vintage portrait of Charles, you could see the photography studio’s name – JEROME – imprinted at the bottom. (See photo #2, an enlarged version of the logo) Doing an online search reveals this studio existed in Arthur, Illinois from 1877-1885. Given that Charles was born in 1855 and probably worked a few years to have achieved some success, we can deduce that the photo was likely taken sometime around 1880-1885. Fabulous detective work! But wait! Another clue is revealed under the magnifying glass; Charles is wearing a wedding ring. In the 1880 census, he was listed as single; in the 1900 census it denotes he’d been married to a woman named Sarah for 17 years, which would have been 1883, but the 1910 census reveals that Sarah was his second marriage. This means Charles was married to an unknown woman sometime between 1880 (when he was single) and 1883 (when he married Sarah). Indeed, a picture can be worth a thousand words. Finally, I suggest setting the photo aside for a couple of weeks, then take it out again and look at it with a fresh set of eyes – and your magnifying lens – and you might see new details you missed the first time. After all, it’s these details that give you a better glimpse into the life of your ancestor. About the Author: Kerry Steiner’s love of research and writing began when she enlisted in the U.S. Army as a photojournalist, a capacity she served in from 1983-1996. During that time, she received both a first and second place in an international military writing competition wherein research played a large part. In 1992 she began working on her own family tree, at a time when information was gathered by going to libraries and writing letters to county clerks around the country. Word got out, and thankfully, the internet was taking off! So in 1997, she began doing family research for other people. In reality, though, it was more of a paid hobby as no formal business structure was in place – that is until she became an empty-nester and formed Aspen Genealogy, LLC. Kerry does about 60 research projects a year and three-fourths of them are from people who are seeking their Native American heritage. This is no surprise as she’s been active in the Native community near her home in Indianapolis since the early 1990s. In addition, she also has a knack for helping others get past a brick wall. 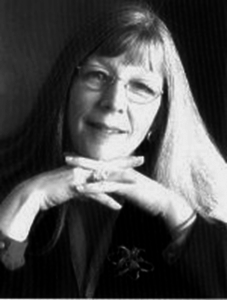 Kerry is a member in good standing of the Association of Professional Genealogists, the National Genealogy Society and the Indiana Genealogy Society. Her clients have come from Florida to California, and she enjoys helping each of them find their history. After all, like roots of the Aspen, we are all connected. You can find Kerry on Facebook, Twitter and Instagram.